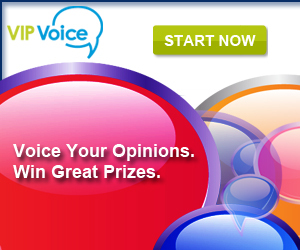 Join VIP Voice and complete surveys for VIP Points and be entered into the $1000 Registration Sweepstakes. For each survey you complete, you will earn VIP points. With their tiered rewards program, the more surveys you take the more points you earn. Use points in sweepstakes and auctions for great rewards. Prizes include vacations, electronics, appliances, and much more.